I have a quick question, I have dark scars on my legs from old cuts and bruises because the skin on my legs are thicker should i use a 2mm size needle? For pigmentation spots on large areas, buy a regular 0.5 mm dermaroller (roll the whole area three times a week) and a 1.5 mm dermastamp with 35 needles (stamp the individual dark spots every three weeks). Apply our 0.5 % Tretinoin cream into the spots right after stamping and also about three times a week (without stamping). A 0.5 mm roller will increase the turnover of the skin, which should improve pigmentations and the dermastamp will take care of deeper layers. Do the same routine to the stretch marks on your calves. 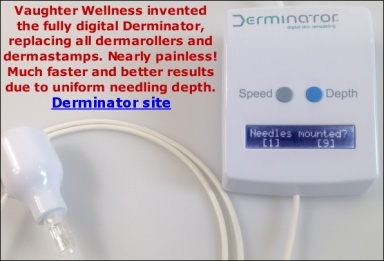 I usually recommend a combination of a regular 1.5 mm dermaroller and a 1.5 mm dermastamp and the Tretinoin cream for stretchmarks but in your case, it is not necessary to buy a 1.5 mm size roller if you use the above suggested tools for pigmentation. You are in a hard spot because your hyperpigmented spots should be protected from the sun to avoid reappearance/worsening of the pigmentation whereas your stretch marks should be eventually sun exposed (if they are lighter than the surrounding skin) to encourage melanin pigment production.